The Frigidaire 16.6 cu. ft. Upright Freezer offers plenty of room for all of your favourite frozen items, along with a variety of ways to organize them! Featuring SpaceWise<sup></sup> baskets, adjustable temperature controls and smart safety lock features, this freezer is an ideal addition to any home or office space. If you're in the market for the ideal freezer for your condo, apartment, trailer, or cottage etc, your search can stop here with this superb upright model from Danby. This compact unit can provide you with 4.3 cubic feet (122 litres) of cooling and storage area without taking up too much room. If youre in the market for some extra freezer space for your condo, apartment, trailer, or cottage, your search can stop here with this handy upright model from Danby. This compact unit can provide you with 4.3 cubic feet (122 litres) of extra cooling and storage area without taking up too much room. Your electricity bills will also be kept in check since this freezer is Energy Star rated. Featuring three convenient door shelves and an additional pair of quick-freeze shelves it's simple to keep all your frozen goods organized. This model comes in a fresh fresh white finish and boasts a scratch-resistant worktop for storing extra accessories. 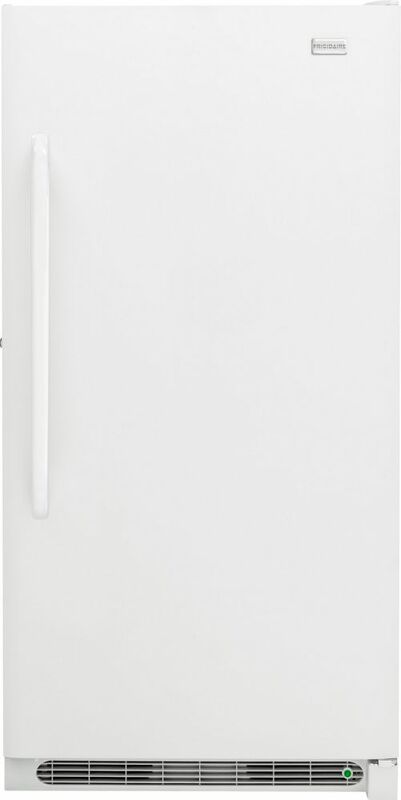 This contemporary spotless steel upright freezer by Danby is ideal for any type of household. The upright design and spotless steel finish allow it to easily integrate into any space or match with existing stainless kitchen appliances. The generous 8.5 cubic feet (241 litres) of storage space is ideal for families and couples and provides ample extra freezer space when your primary fridge/freezer is maxed out. Also features an Energy Star rating for reduced operating costs, convenient reversible door swing for left or right hand opening and a scratch resistant worktop. Ideal for basements, cottages, and office lunchrooms this Manual Defrost Upright Freezer offers great storage space in a smaller unit. The ENERGY STAR rating helps you save money on electricity costs, plus it features a convenient mechanical thermostat and a scratch-resistant worktop. 16.6 Cu. Ft. Upright Freezer with SpaceWise Baskets in White - ENERGY STAR® The Frigidaire 16.6 cu. ft. Upright Freezer offers plenty of room for all of your favourite frozen items, along with a variety of ways to organize them! Featuring SpaceWise<sup></sup> baskets, adjustable temperature controls and smart safety lock features, this freezer is an ideal addition to any home or office space. 16.6 Cu. Ft. Upright Freezer with SpaceWise Baskets in White - ENERGY STAR® is rated 4.6 out of 5 by 2997. Rated 5 out of 5 by Freezer from Like it. Like it. Rated 5 out of 5 by AntiguoSEA from Large, quiet, cool!... Large, quiet, cool! Rated 5 out of 5 by Steve from It’s working wonderfully!... It’s working wonderfully!